We’d been meaning to go to the Monchique sausage festival (Feira dos Enchidos Tradicionais de Serra de Monchique) for years and today was the day we finally made it! Earlier in the week I went to the Tourist Information office keen to discover more about the Feira. Unfortunately, they only had basic information such as date/time and that exhibitors included crafts, cakes, medronho, honey and of course, sausage! All this hand-written on a scrap of paper as no printed literature was available. There was also going to be ‘Animation’ throughout the day and although I pressed for further information such as what it was and when it started – my request was met with a shrug and I was given the Camara Municipal’s website. I managed to glean a little more information with the help of Google translate from the Monchique Camara Municipal’s. It is one of the most important events in the South of the country and has more than 50 exhibitors. Want to publicise and promote artisanal Delicatessen serrana derived from black pork and produced using traditional methods in the region, as well as, provide a focal point for the dissemination and promotion of other products Sierra as the traditional grappa brandy made from Arbutus Berry, homemade sweets, typical of the region, honey, liqueurs and crafts. 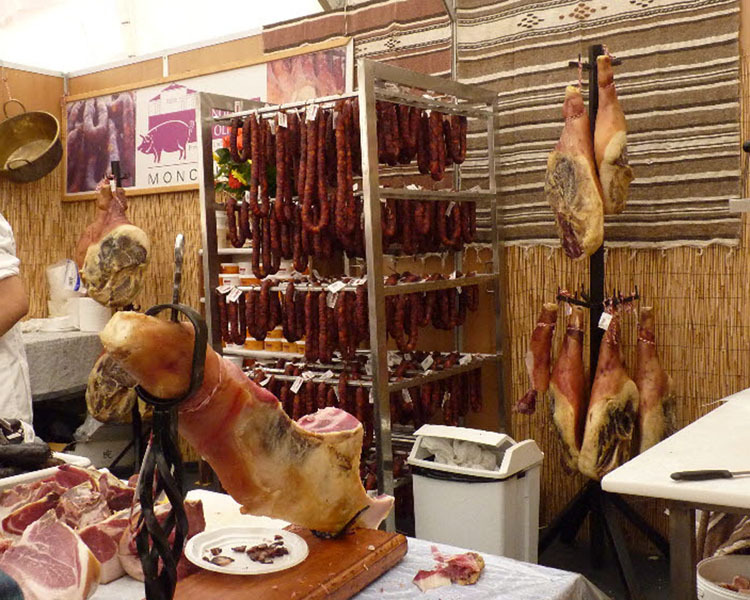 The fair of Sausages develops around the pavilions of exhibition and sale of sausages and other traditional products and takes place at Municipal Heliport. After a wibbly wobbly drive round hairpin bends and through beautiful countryside we arrive in Monchique. We find the Heliporto Municipal, park the car and walk to the huge marquee-style building. As we enter the Heliporto I immediately spot and make a bee-line for a stand with the producer selling one of my favourite liquors; Aguardente de medronho, o mel e o limao (Medronho with honey and lemon). I’ve looked for this particular local brand of medronho for ages without success. I could never remember the name ‘Monte da Lameira‘ only its distinctive label. We tentatively approach the stand and I’m delighted the woman spoke English which is great! Now I can not only ask more in-depth questions but also understand the answers! 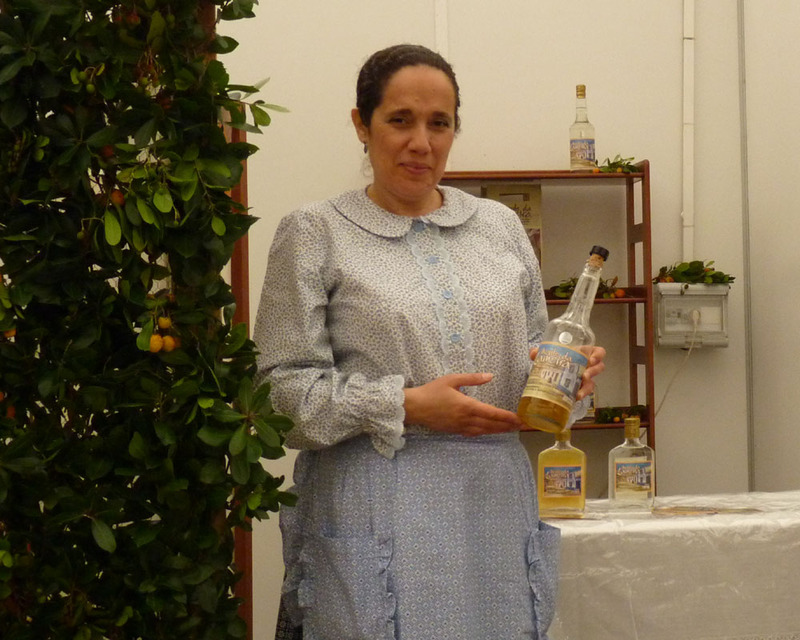 She plays us their video and explained how Medronho is distilled – we are fascinated. 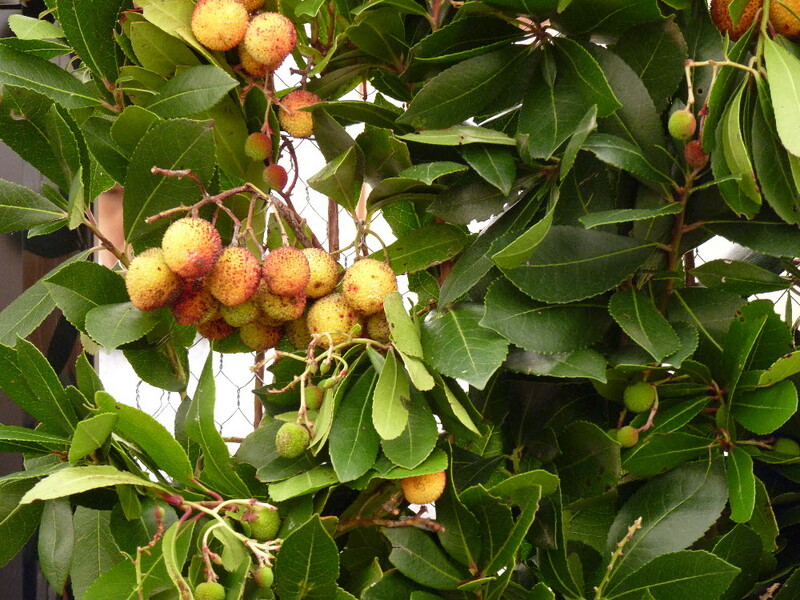 It takes 15kg of berries from the Strawberry Tree (Arbutus unedo L) to produce 1 litre of Medronho! It takes 15Kg of berries to produce just 1ltr of Medrono! Unfortunately, they do not have a website only a card with their name: Monte da Lameira~ Aguadente de Medronho, mobile phone number and email. The video is also not available on YouTube – a great shame because I would love to share a link to the video in this post to help promote their Medronho. When I return home I study the leaflet only to discover there are no basic details such as opening times or contact details. A great shame because it’s a long way to drive on a wing and a prayer that the shop will be open! Such simple useful information which should be included – I wonder who is responsible for their marketing? As we wander round the Feira I’m amazed by the number of stands selling Medronho distilled in Monchique! I am tempted to “try” them all, however common sense overcame this temptation and I resist. Medronho is extremely potent and is aptly named “Fire Water” for a good reason! My next purchase, some local honey, tastes so different to the mass-produced product we buy in the supermarket. I might be Piglet but like Winnie the Pooh, I love honey. Although I look at the tempting displays of delicious cakes I resist because I have just made my first Chocolate Chouriço (Salami). We pause at one stand fascinated by an elderly man carving and selling handmade wooden spoons. He is delighted to show us his craftwork and it gives me a great opportunity to (try)practice speaking Portuguese. We get by, sort of, and had a half decent conversation about his one and only trip to England twenty years ago. I try to discover the type of wood he uses for the spoons. It begins with O sounds like “osso” and is not olive. Any ideas? Finally, we arrive at the sausage producers’ stands and I try several different types of sausage before deciding which one to buy. My favourite is black in colour and contains rice. I’ve not seen this before and wanted to buy one. However, Mr Piglet is not impressed and not wanting to eat a huge black sausage on my own I conceded defeat. However, I struck lucky with the Chouriço sausage and found a woman ready to go “halves” with me. In hindsight I should have asked her if she fancied sharing the black sausage with me as well. There are many stands including crafters such as a woman weaving. I could have spent a further hour just wandering and chatting to the stall holders who were not busy. But with no sign of “Animation” I felt Mr Piglet was listless and ready to drive back down the mountain and home. Would we go next year? Yes, most definitely! For further details of future events in Monchique you may find the Calender of Festas, Feiras e Romarias in Monchique 2012 of interest. I enjoyed walking round the market with you Carole, and felt like we’d gone back 100 years – fascinating, and good that they still keep to the old ways. Lucky you, I love visiting fairs as well, where you can see traditional things being made. I thought the wooden spoons were either made of Pine (pinho) or beech (faia), but I have been looking online and could only find reference to them being made of pine. I´m not too fond of that black sausage, but then I´m too fussy with food. My favourite Portuguese sausages are “chouriço”, “alheira” (made with chicken and bread) – you can get them in restaurants served with a fried egg and rice – and “farinheira” (made with pork) which is used in the Cozido à Portuguesa. I will have to try the varieties of sausage mentioned. I’m expanding my food Vocabulary all the time! I enjoyed reading this. It’s the first time I’ve heard of anyone using the fruit of the strawberry tree, I read somewhere that it is called unedo because it means ‘eat once’ because you’d never want to try it again! Clearly that’s not the case with the firewater. I empathised too with your difficulty in getting information about the fair. It’s often like that here, people go to such effort to organise things and put no effort at all into le marketing. The marketing of events is so sloppy it drives me crazy!!! Whre we are the strawberries don’t stay on the bushes for very long! I saw some strawberries, went back for my camera and when I returned to take a photo they were gone! My husband would love this place! It looks like a wonderful fair. I will try to go next year. Thank you for the link detailing some of the fairs this year. It is difficult to get hold of this information. Today I saw sign for a horse fair at Pincho next Sunday attached to a lampost. Hi Clara, I think next year I would go in the evening for the music as well. The stage they errected was enormous, so the group must have been good to justify all the equipment.. Interested re horsefair at Pincho, where is that? Any idea what time, please? Sounds wonderful, PiP! When I ate sausage ~ chorizo and andouille were two of my favorites. Keep the money, and give me the honey! You can have Too much of a good thing! That sounds like it was so much fun! I love festivals like that. Loved this. I haven’t been to this fair ever. Will definitely try to go next year, for the honey and lemon “medronho”, that is. I’m very fussy about sausages. 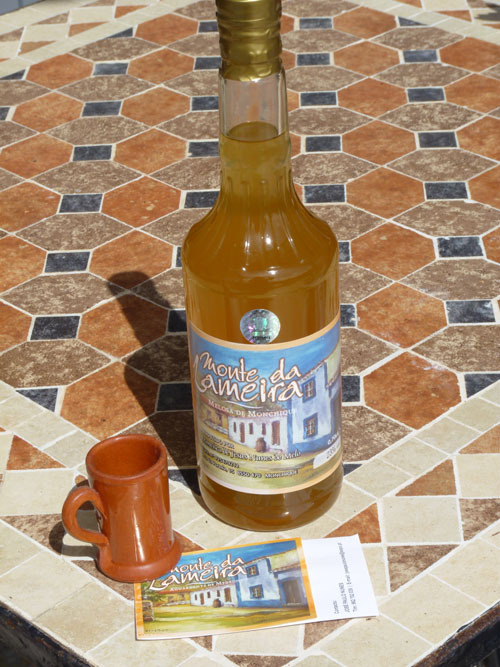 A can’t stand “alheira” or “farinheira”, unlike Sami. I find them to fatty. On the other hand, I love “Cozido à Portuguesa” and am curious as to what unmentionables there were in the one you had. I would go in the evening weh there is entertainment…perspas we could meet up? Sausages- not really thanks. Cheese and cakes are more our things. The crafts are always interesting though. Just had a chat with students who come from Monchique. They will confirm opening hours of that shop and they recommended the “Feira do Presunto” (Smoked Ham Fair) in June/July. I forgot to ask about the wood used for making spoons. “My favourite is black in colour and contains rice” it’s “Morcela de Arroz”, interesting to know that they do it in Monchique, it’s unsual on the south of Portugal, it’s commom at the center (Leiria). And if you want some recipes with Medronho here’s the site http://www.confrariadomedronho.org/index.php?option=com_content&view=category&id=3&Itemid=6; it’s a Confraria (brotherhood ??) of the medronho. Apologies for delay in response! thank you so much for the YouTube link I will see if I can include in the post.